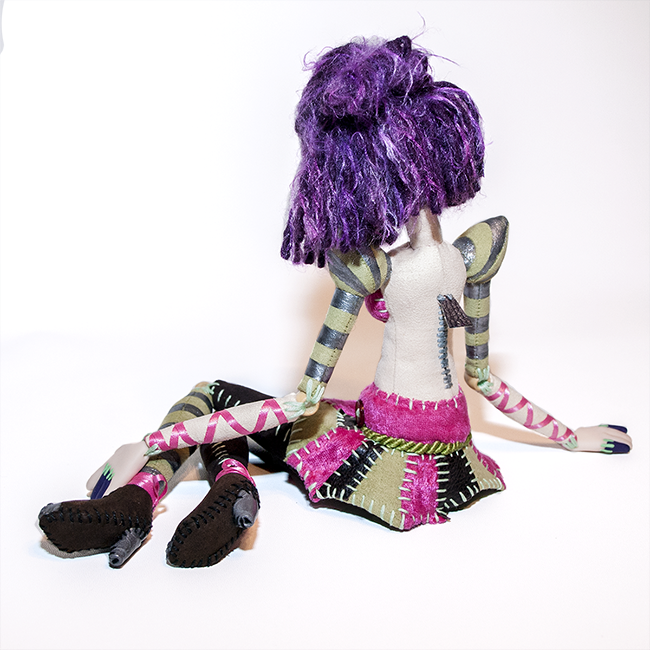 A handmade doll of Orianna, in her creepy and adorable Sewn Chaos skin. Orianna's body is made from faux suede and stuffed with poly-fil stuffing. Her silver stripes are hand painted with metalic fabric paint, and her pink ribbons are glued in place. Her hands are custom sculpted from polymer clay, and her joints are wooden beads held in place with emroidery thread, allowing for movement. Her hair is made from frizzy purple yarn, and all of her large green stitches have been carefully hand embroidered to add to her chaotic aesthetic.